I thought this was perfect timing for this kimchi recipe after my recent attendance at The International Kimchi Conference! 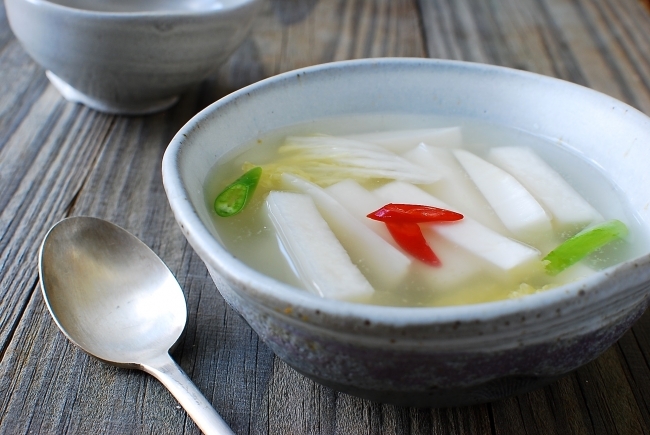 Dongchimi (동치미) is a mild water-based kimchi made with a small variety of white radish called dongchimi mu. It’s typically made in late fall, when radishes (무) are in season, and eaten in the winter. 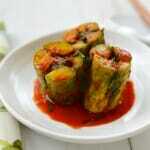 The word dongchimi means “winter water kimchi“. Traditionally, dongchimi is made with whole radishes and therefore takes weeks to mature. 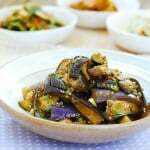 This recipe is a quick version which is commonly called “summer dongchimi” in Korea. The radishes are cut into small pieces for quick salting and maturing. Within two days at room temperature, you’ll see bubbles rising through the brine which is a sign of active fermentation. I had some trouble finding good radishes this summer, so I used a little bit of sugar here to balance out the bitter taste of summer radish. The good news is that radish season is right around the corner. Soon, you’ll be able to find sweet, juicy, and crunchy Korean radishes, which will be perfect for this recipe! 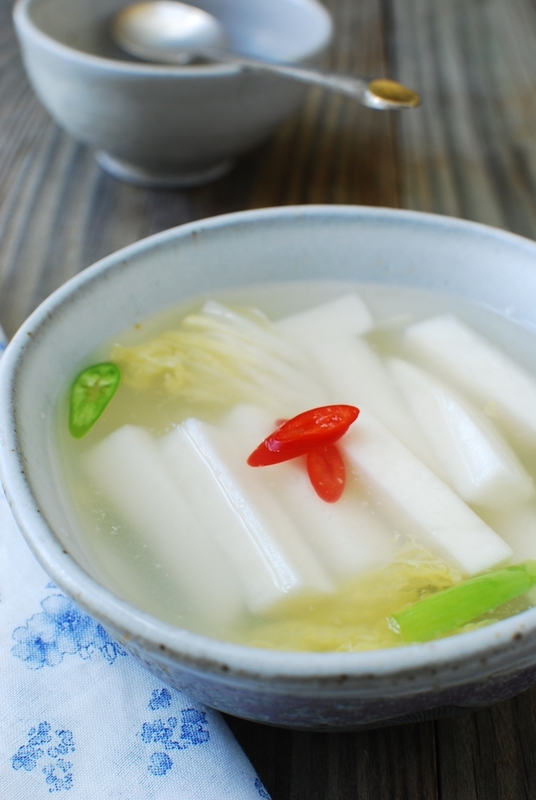 During fermentation, healthy bacteria, acidity and sweetness develop, producing a tangy, refreshing broth with perfectly pickled radish. 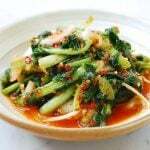 Due to a digestive enzyme (diastase) that is plentiful in radishes, this kimchi promotes digestion, which is why it pairs especially well with meat dishes or starch heavy foods such as rice cakes. The broth (국물) is great as a soup base for cold noodles like naengmyeon (냉면) and dongchimi guksu (동치미 국수). 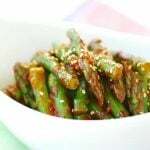 Try this recipe, and find out how easy it is to make with only a few ingredients. I guarantee you will be hooked forever! One 1-gallon jar or air-tight non-reactive container. If you’re using cabbage, start with it first because the cabbage takes longer to be salted. Cut each leaf of the cabbage into 2-inch long and 1/2 – 1-inch pieces. Dissolve the salt in a cup of water and pour over the cabbage. Stir to coat the cabbage pieces with the salt water. Let sit for a couple of hours until softened. Rotate the bottom ones to the top once or twice midway through the process. Rinse and drain. Clean the radishes by scrubbing with a brush and/or scratching off the impurities with a small knife. Peel the skin only if necessary. The skin is packed with nutrients. Cut each radish crosswise into about 2-inch logs. Then cut each log into 1/2-inch thick pieces and then each piece into 1/2-inch thick sticks, placing in a large bowl. Sprinkle the salt and sugar over the radishes and toss well to coat evenly. Let sit for about 30 – 40 minutes until the radish sticks have softened and released some liquid. Drain, saving the liquid to add to the brine later. Do NOT rinse. Whisk together the glutinous rice powder and 1 cup of water, and simmer over low heat, stirring occasionally, until the mixture thickens into a thin paste. Set aside to cool. Place the pear (or apple), garlic, ginger and optional onion in the blender. Add 1/2 cup water. Puree it as fine as possible. Run it through a fine strainer to remove any leftover solids, if desired. Place the salted radish and cabbage in a jar or air-tight container. Add the scallion and peppers. Pour the brine over. Stir well together. Taste the brine. Add more salt if necessary. If the brine is too salty, add more water to dilute. It should be a tad salty to eat as is. Leave it out at room temperature for a full day or two until bubbles rise through the brine. Taste again and adjust the salt level if necessary. Then, store in the fridge. 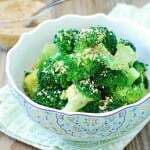 Although you can start eating it any time at this point, it will need about a week or two in the fridge to fully develop the acidic, tangy flavors. It keeps well for several weeks in the fridge. Stir from the bottom each time you ladle the broth from the jar or container to serve. 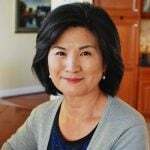 Hi, I am new to Korean cooking and have become a fan of persimmons and shingo pears. Trader Joe’s is now selling dried Korean shingo pears. They taste good on their own but I’m thinking they would be great in a cake or pastry. Do you have any recipes you could share using shingo pears? Thank you!! Dried Korean pears at Trader Joe’s? That sounds great. I have to think about this. Will let you know if I come up with any good idea. You’re right, Nami. This kimchi is perfect for people who don’t like spicy food. Pear is commonly used in kimchi. Thanks for stopping by! 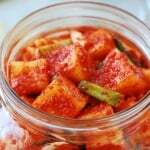 This kimchi looks so comforting and tasty! A totally different dish from the ones we make here in Greece! Thank you, Katerina. I’m now curious about the ones made in Greece. That doesn’t sound good. Maybe you didn’t use enough salt? The fall/winter radish is good, so it’s good time to make this now. Hope my recipe will work better for you. I’ve heard from some of my readers that this turned out delicious for them. Cheers! I made this a few weeks ago and it turned out great! Super easy, super delicious. It’s one of my favorite kinds of kimchi, so thank you for this recipe! So happy to hear that! Thanks for letting me know. Cheers! Hi! 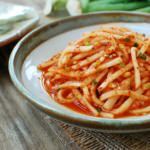 Can you tell me why lot of kimchi recipes requires “glutenous flour” paste? What does it exactly do to kimchi? What happens if I omit it? What kind of kimchi doesn’t require the glutenous paste? Thank you!!! It’s used in kimchi for various reasons depending on what type of kimchi it is. In general, it’s used to thicken the kimchi seasoning or brine and add natural sweetness from the grain, which helps bring the flavors together. 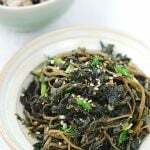 Sometimes, it’s used to help rid of grassy taste from certain green vegetables such as young radish leaves (yeolmu). It’s also used to help promote the fermentation process. You can omit it if you want from any kimchi. It’s a common ingredient, but certainly not the must-have. Hi I read a recipe which uses cheese cloth versus purée. What is the difference between the two methods? So sorry about the late reply. I somehow missed your comment at the time. The use of cheese cloth will result in cleaner broth without tiny bits of pureed aromatic vegetables. It’s a matter of preference. Hi if i can’t get korean radish is it ok to use daikon? I’ve had this recipe bookmarked for a while and finally made it the other day!! It’s been so hot in NY, so wanted to make something refreshing. This was so easy I can’t believe I didn’t make it sooner!! Thanks so much for the recipe!! I can’t wait to impress my in laws with this! I made dongchimi, but after 1 day of being in room temperature, it is bubbling but the brine is quite thick and slimy. It smells fine and tastes good, but not sure why the brine is so thick and slimy. Otherwise smells fine. Will it clear out as fermentation process continues? Thanks. For now I just put in fridge to slow down the fermentation process. It could be the scallions that have extra slimy stuff in the green tubes. Sometimes sugar does that. It should be fine to eat. You did the right thing. I will get clear up some as it ferments. Definitely appreciate your recipes but really wish there was a button to put them into a printable format. It’s quite difficult to keep reading my PC at the same time I’m in the kitchen cooking. To cut the photos and excess and put onto one page is really convenient for home cooks. I’ve been doing that for a while with new recipes and converting the older ones. But, I know I still have a lot of older recipes to get to. Sorry about the inconvenience. If my brine is too salty can I just add more water to fix it? Or can I wait to add water when I serve it? Thanks in advance! You can add water now.